Alta California (English: Upper California) was a province and territory in the Viceroyalty of New Spain and later a territory and department in independent Mexico. The territory, created in 1804 out of the northern part of the former province of Las Californias, an area now comprising the modern state of California and other states to the east. Neither Spain nor Mexico ever colonized much beyond the southern and central coastal area, so effective control never extended much beyond Sonoma in the north or the California Coast Ranges in the west. Most of interior areas such as the Central Valley and the deserts of California remained in de facto possession of indigenous peoples until later in the Mexican era when more inland land grants were made, and especially after 1841 when overland immigrants from the United States began to settle inland areas. Alta California ceased to exist as an administrative division separate from Baja California in 1836, when the Siete Leyes constitutional reforms in Mexico re-established Las Californias as a unified department. The areas formerly comprising Alta California were ceded to the United States in the Treaty of Guadalupe Hidalgo that ended the Mexican–American War in 1848. Two years later, California joined the union as the 31st state. Other parts of Alta California became all or part of the later U.S. states of Arizona, Nevada, Utah, Colorado and Wyoming. The Spanish explored the coastal area of Alta California by sea beginning in the 16th century and considered the area a domain of the Spanish monarchy. During the following two centuries there were various plans to settle the area, none of which were effectively carried out. These included: (a) Sebastián Vizcaíno's expedition in 1602–03 preparatory to colonization planned for 1606–07 which was cancelled in 1608; (b) plans promoted by Father Eusebio Kino who missionized the Pimería Alta from 1687 until his death in 1711, (c) plans by Juan Manuel de Oliván Rebolledo in 1715 resulting in a decree in 1716 for extension of the conquest (of Baja California) which came to nothing; (d) Juan Bautista de Anssa's proposed expedition from Sonora in 1737; (e) a plan by the Council of the Indies in 1744; (f) and the one by Don Fernando Sánchez Salvador, who researched the earlier proposals and suggested the area of the Gila and Colorado Rivers as the locale for forts or presidios preventing the French or the English from "occupying Monterey and invading the neighboring coasts of California which are at the mouth of the Carmel River." Alta California was not easily accessible from New Spain: land routes were cut off by deserts and often hostile Native populations and sea routes ran counter to the southerly currents of the distant northeastern Pacific. Ultimately, New Spain did not have the economic resources nor population to settle such a far northern outpost. Spanish interest in colonizing Alta California was revived under the visita of Interior Provinces and push Spanish settlement further north. In subsequent decades, news of Russian colonization and maritime fur trading in Alaska, and the 1768 naval expedition of Pyotr Krenitsyn and Mikhail Levashev, in particular, alarmed the Spanish government and served to justify Gálvez's vision. To ascertain the Russian threat a number of Spanish expeditions to the Pacific Northwest were launched. In preparation for settlement of Alta California, the northern, mainland region of Las Californias was granted to Franciscan missionaries to convert the Native population to Catholicism, following a model that had been used for over a century in Baja California. The Spanish Crown funded the construction and subsidized the operation of the missions, with the goal that the relocation, conversion and enforced labor of Native people would bolster Spanish rule. By law, mission land and property were to pass to the indigenous population after a period of about ten years, when the natives would become Spanish subjects. In the interim period, the Franciscans were to act as mission administrators who held the land in trust for the Native residents. The Franciscans, however, prolonged their control over the missions and ran them for more than sixty years. The transfer of property never occurred. Due to the growth of the Hispanic population in the Alta California by 1804, the Province of Las Californias, then a part of the Commandancy General of the Internal Provinces, was divided into two separate territorial administrations following Palóu's division between the Dominican and Franciscan missions. Governor Diego de Borica is credited with defining Alta California and Baja California's official borders. The Baja California peninsula became the territory of Baja California ("Lower California"), also referred to at times as Vieja California ("Old California"). The northern part became Alta California, also alternatively called Nueva California ("New California"). Because the eastern boundaries of Alta California Province were not defined, it included Nevada, Utah and parts of Arizona, New Mexico, western Colorado and southwestern Wyoming. The province bordered on the east with the Spanish settlements in Arizona and the province of Nuevo México, with the Sierra Nevada or Colorado River serving as the de facto border. 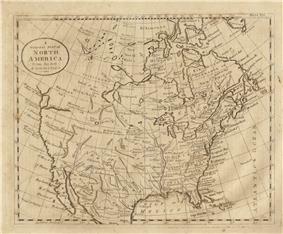 The Adams–Onís Treaty of 1819, between the United States and Spain, established the northern limit of Alta California at latitude 42°N, which remains the boundary between the states of California, Nevada and Utah (to the south) and Oregon and Idaho (to the north) to this day. Mexico gained independence from Spain in 1821 upon conclusion of the decade-long Mexican War of Independence. 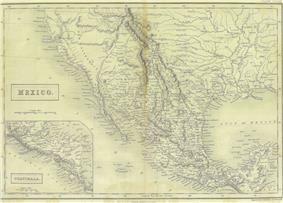 As the successor state to the Viceroyalty of New Spain, Mexico automatically included the provinces of Alta California and Baja California as territories. With the establishment of a republican government in 1823, Alta California Territory, like many northern territories, was not recognized as one of the constituent States of Mexico because of its small population. 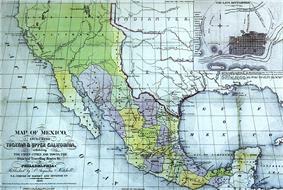 The 1824 Constitution of Mexico refers to Alta California as a "territory". In 1836, Mexico repealed the 1824 federalist constitution and adopted a more centralist political organization (under the Siete Leyes) that reunited Alta and Baja California in a single California Department (Departamento de las Californias). The change, however, had little practical effect in far-off Alta California. The capital of Alta California Territory remained Monterey, as it had been since the 1769 Portola expedition first established an Alta California government, and the local political structures were unchanged. The 1824 constitution was restored in 1846. A more important development was increasing resentment of appointed governors sent from distant Mexico City, who came with little knowledge of local conditions and concerns. The friction came to a head in 1836, when Monterey-born Juan Bautista Alvarado led a revolt and seized the governorship from Nicolás Gutiérrez. Alvarado's actions began a period of de facto home rule, in which the weak and fractious central government was forced to allow more autonomy in its most distant department. Other local governors followed, including Carlos Antonio Carrillo, Alvarado himself for a second time, and Pío Pico. The last non-Californian governor, Manuel Micheltorena, was driven out after another rebellion in 1845. Micheltorena was replaced by Pío Pico, last Mexican governor of California, who served until 1846. In 1846, following reports of the annexation of Texas to the United States, American settlers in inland Northern California formed an army, captured the Mexican garrison town of Sonoma, and declared independence there as the California Republic. At the same time, the United States and Mexico had gone to war, and forces of the United States Army and Navy entered into Alta California and overpowered the Mexican garrison and Californio militia units. The forces of the California Republic abandoned their independence and assisted the United States forces after their arrival. The California Republic was never recognized by any nation, and existed for less than one month, but its flag (the "Bear Flag") survives as the flag of the State of California. In southern California, the Californios formed defensive units, which were victorious in the Siege of Los Angeles, the Battle of San Pasqual and the Battle of Domínguez Rancho. But subsequent encounters, the battles of Río San Gabriel and La Mesa, were indecisive. The southern Californios formally surrendered with the signing of the Treaty of Cahuenga on January 13, 1847. After twenty-seven years in independent Mexico, California was ceded to the United States in 1848 with the signing of the Treaty of Guadalupe Hidalgo. The United States paid Mexico fifteen million dollars for the total lands ceded. Spanish Empire, first by the Portuguese explorer Juan Rodríguez Cabrillo in 1542, upon entering the bay of San Diego, then sailing north to the Russian River. Claim validated and area mapped in 1602 during the sea voyage of the San Agustín under Sebastián Vizcaíno. Golden Hind under Captain Francis Drake at Bodega Bay, Tomales Bay, Drakes Bay or Bolinas Bay (exact location disputed). Russian-American Company, by Ivan Alexandrovich Kuskov, the founder of Fort Ross and, from 1812 to 1821, its colonial administrator. Note: There is an overlap of rule with the Mexican Empire (second item below), until the Russians sold Fort Ross in 1841 to John Sutter, and subsequently left the area in 1842. Argentina, by Hippolyte de Bouchard, a French corsair who occupied Monterey from November 24 to November 29, 1818, raising the Argentine flag there and claiming Alta California for that country. United Mexican States, 1823, until January 13, 1847, at Los Angeles. Bear Flag of the California Republic, June 14, 1846, at Sonoma until July 9, 1846. ^ Haycox, Stephen W. (2002). Alaska: An American Colony. University of Washington Press. pp. 59–60.